What a rainy Monday! We are staying dry and warm inside...hope you are too! 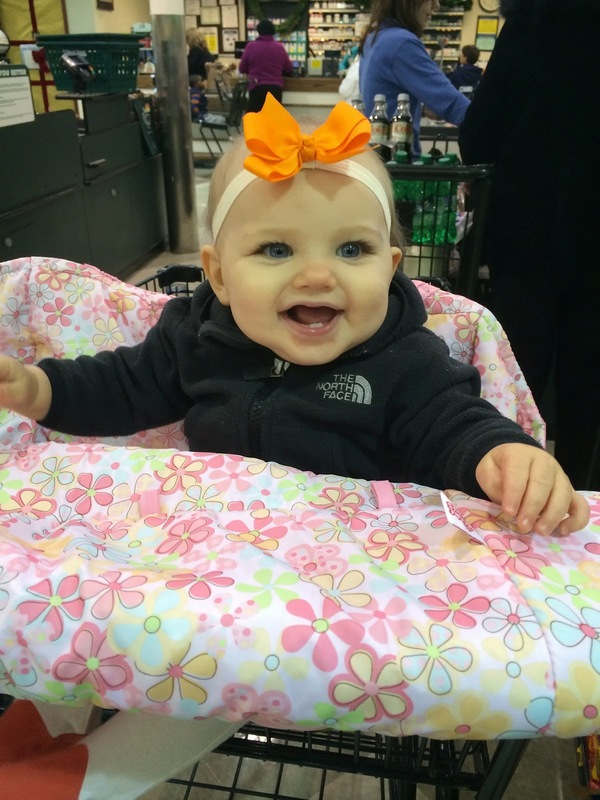 I'd love you SOOO much if you'd vote for Ella HERE! You can vote once a day, everyday, until December 14! 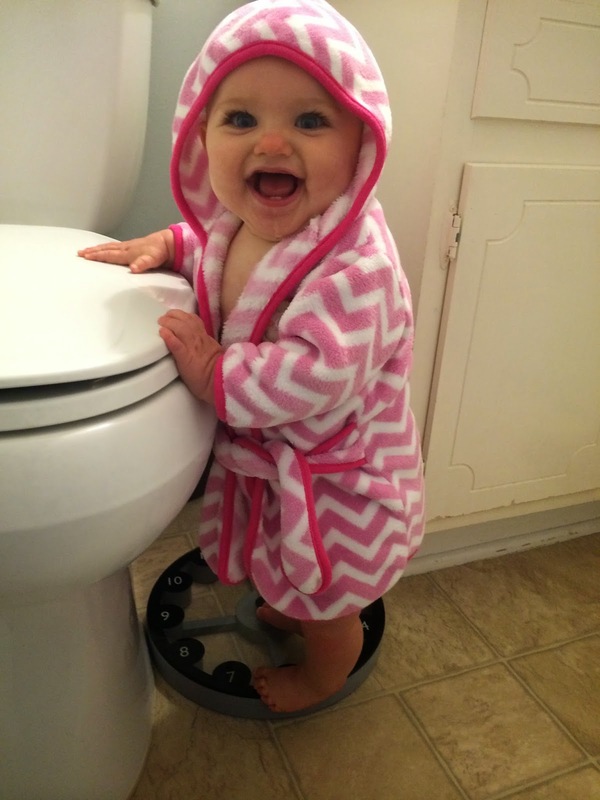 We also had to steam a little bit in the bathroom because Ella is having some sniffles due to allergies. She wasn't upset about it at all though! Tuesday, we didn't do too much! Just took a nice walk around the neighborhood because the weather was so wonderful! 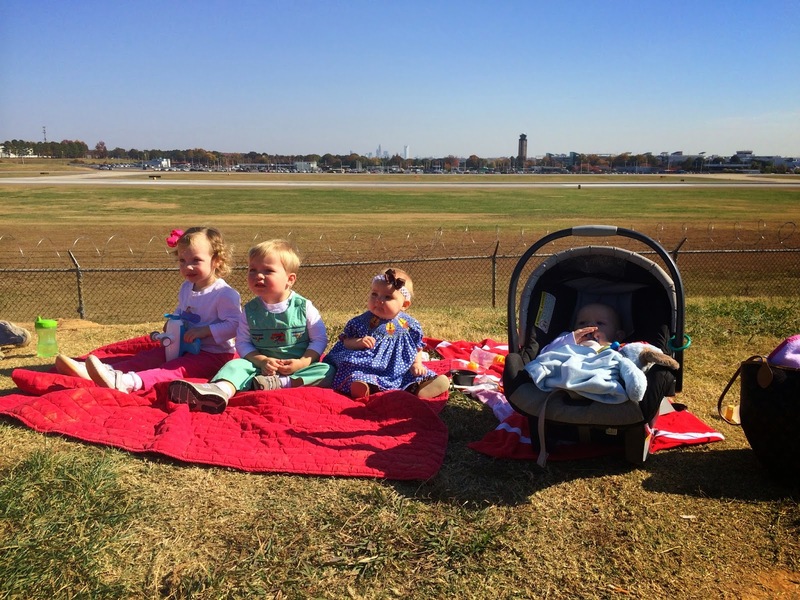 On Wednesday we met up with some of our playgroup friends at the airport overlook! Ella loved watching the planes!! At first, she wasn't sure what to make of it, but then she started waving and clapping as the planes took off...it was the cutest thing! 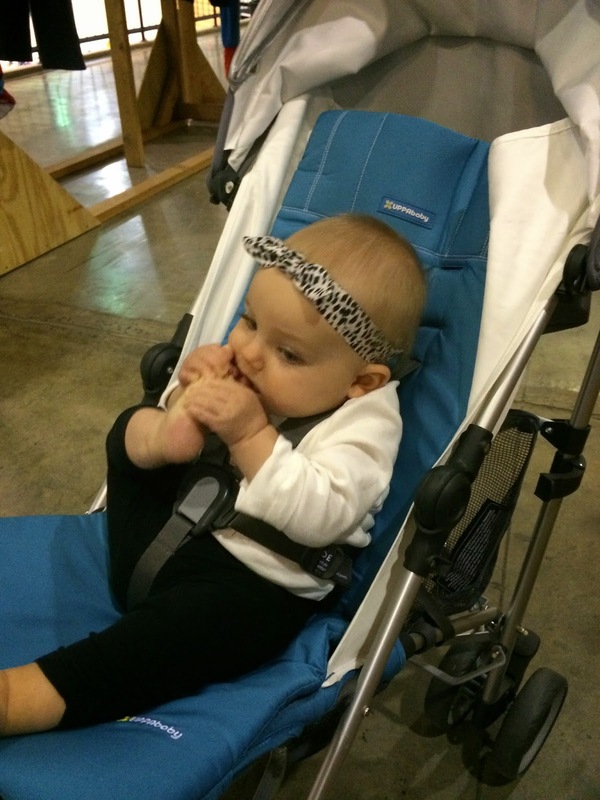 Thursday, we hit up a few consignment sales, but all Ella was interested in was her foot. Thursday also marked the day that Ella was 40 weeks and 3 days...which is exactly how long she was in my belly! So we had to make a chalkboard and take a picture to commemorate! 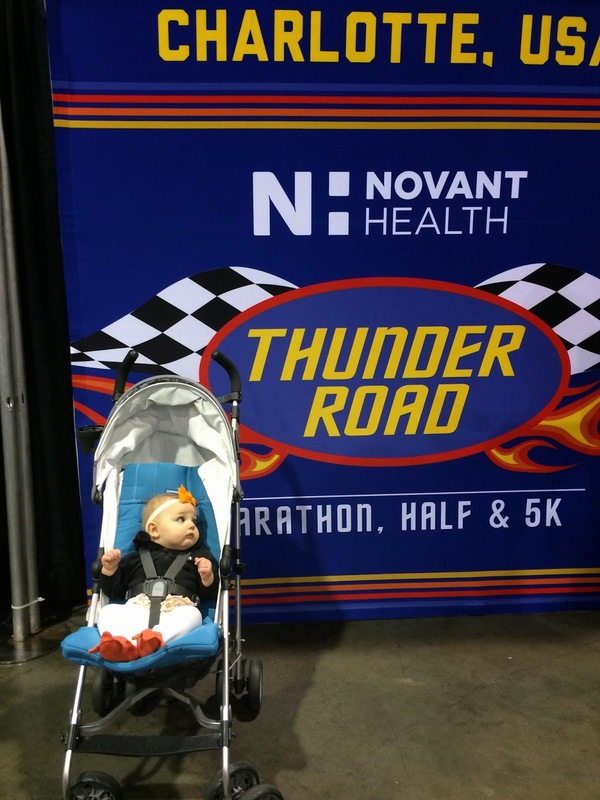 Friday, we went to pick up my half marathon bib at the running expo! We also stopped at HT to get stuff to make my lucky spaghetti...it's what I always eat before a race!! I am not sure why but my anxiety level was at an all-time high before this race. Like, I seriously was on the border of having a major panic attack on the way to the race. I was SO nervous!! It was soooo freaking cold (25*, felt like 18*) at the start. I lined up with the 1:35:00 pace group, thinking I could hang with them for a little bit. I went out FAST because I was so freezing (like holding 7:00 miles the first 3 miles)!! So I ended up being ahead of the pace group for a little while. Then came the hills and I about died. The hill up Morehead on mile 8 and then again at mile 10 was about the worst thing ever!! The pace group kept getting further and further ahead of me. I also felt like there weren't as many people out cheering as there normally are, prob bc no one wanted to stand in the cold...I don't blame them! I managed to finish at 1:36:25...about 30 seconds off my best. I was 7th in my age group (fun fact: if I was 30, I would have won my age group!! Only time I've ever wanted to be 30, haha)! Not too bad for just having a baby 9 months ago! My sweet girl came to greet me at the finish line...she was freezing, but thankfully Travis had her all bundled up!! 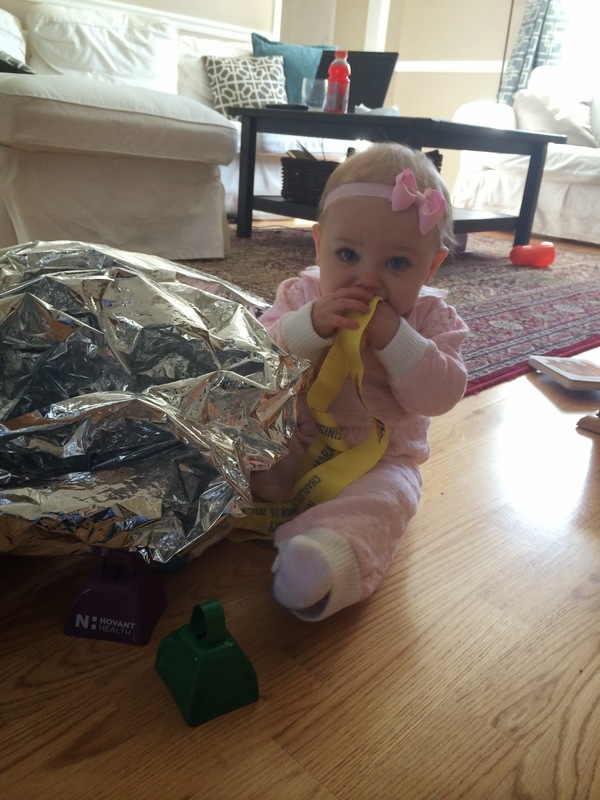 The rest of the day, we spent relaxing, and Ella played with her new "toys"...my finisher's medal, space blanket (oh man, she loved that thing!) and cowbells! Yesterday, my parents were in town, so they spent most of the day playing with Ella! Ella did not like my mom's readers...let's hope she has 20/20 vision! Congratulations on your half! That's an awesome time! You should check out the South Park Turkey Trot - it's a good one. I am so impressed by your running time!!! That is awesome! Loved the airport pics...BG's been in all turkeys ever since!